PML-N's Shahid Khaqan Abbasi was sworn in as prime minister of Pakistan in an oath-taking ceremony held at President House on Tuesday. President Mamnoon Hussain administered the oath to Abbasi. Abbasi was elected prime minister by lawmakers in the National Assembly earlier today, bagging 221 votes to become the successor to ousted prime minister Nawaz Sharif. PPP's Syed Naveed Qamar secured 47 votes, Awami Muslim League chief Sheikh Rashid received 33 votes, and four MNAs voted for Jamaat-i-Islami's Sahibzada Tariqullah during the ballot. 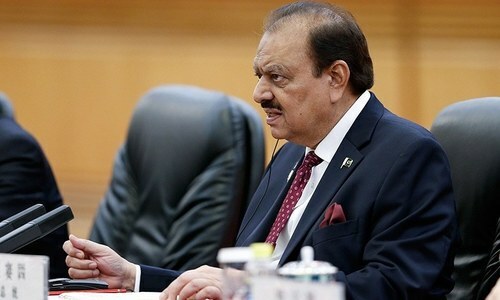 An NA session to elect a new prime minister had been called by President Mamnoon Hussain following a landmark Supreme Court ruling on the Panama Papers case on Friday, in which Nawaz Sharif was disqualified as PM after being deemed unfit to hold office. Following the SC verdict, the PML-N had agreed upon Abbasi, the former petroleum minister, as its candidate for prime minister for the interim period till the 'permanent' replacement could be elected. Abbasi has to eventually give way to Shahbaz Sharif, who is likely to compete for the National Assembly seat lying vacant following the ouster of his elder brother and then stand for the chief executive's office. Following the announcement of Abbasi's victory by NA Speaker Ayaz Sadiq, the PML-N benches in the Lower House had erupted with loud sloganeering in favour of Nawaz Sharif. Addressing the lower house soon after his victory was announced, Prime Minister-elect Abbasi said: "I am grateful to you all, for following the democratic process — whether you voted for or against me." "I am grateful to the people of Pakistan, and I am grateful to the 'people's prime minister', Nawaz Sharif," he continued. "I am also grateful to the opposition and Imran Khan for remembering us in their daily slandering," he jibed. Moving on, Abbasi termed the Supreme Court's verdict on the Panamagate case "unprecedented", saying that although the party was blind-sided by the judgement, "we accepted it as it was". "We did not challenge the courts, there was no division in our ranks. The party stands as it was. No one wanted to joust for power — whoever the prime minister [Nawaz Sharif] named was supported unanimously," he said, rebuffing rumours of cracks in the party's ranks following the verdict. "Everybody wants the [prime minister's] chair. Tell me, who in this house doesn't? It is to the PML-N's credit that all party members rallied unanimously behind whoever was nominated by our leader. "Within four days, the democratic process is back on track. There were no defections. There was no dissension in our ranks. "Justice mandates that though a 1,000 guilty people may go free, not even one innocent person should be wrongfully convicted. I will not go into details of Friday's decision — I only want to say that there will soon be another court — one held by the people. There will be no JIT there," he said, referring to the upcoming general elections in 2018. "I am sure that the real prime minister of Pakistan, Nawaz Sharif, will return to this seat." However, he said that, "I am the country's prime minister — bet it for 45 days or 45 hours — and am not here just to keep the seat warm." 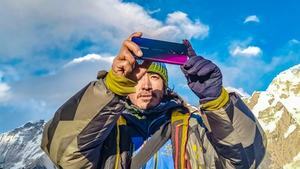 "If I am here for 45 days, I will try to complete the amount of the work that requires 45 months," he vowed. Continuing, the prime minister-elect urged that the Constitution be respected. "Politics, which has come to be seen as a disreputable profession, will be made respectable again." "Be it the government, bureaucracy, opposition or the army — we are in the same boat, and a hole in this boat will sink everyone," he cautioned. "We will continue taking difficult decisions," Abbasi said as he promised to take action against "private militias" providing security to citizens. "There is not a single country in the world which allows the licencing of automatic rifles for citizens. If you go outside parliament right now, you will see a private militia," Abbasi remarked. "Action will be taken against them if my cabinet allows for it. The federal government will seize all automatic weapons, compensating people in return," he promised. The premier, carrying forward Nawaz Sharif and the PML-N's promises, vowed to eliminate loadshedding by November this year as he highlighted various infrastructure and development projects initiated by his party's government as examples of its commitment to the country's growth. "In Pakistan's history, power projects with the capacity to generate 17,000 mega watts were set up before our government. We have added 10,000MW," he said. "Pervez Musharraf may have ruled the country for eight years, but show me just one major development project from that era," he said. "One thing that is very close to my heart is [the collection of] taxes," Abbasi continued. "The perception here is that paying taxes is optional [...] if my cabinet approves, I will set my sights on non-taxpayers," he promised. Abbasi also briefly mentioned a focus on agriculture, education and health services. "Agriculture is the backbone of the country," Abbasi said. "Although I am not an agriculturalist, I feel their pain," he said. Speaking about the state of education, the premier called for improvements in higher education and the need for a national testing mechanism. Abbasi also touched upon the PM's Health Card scheme introduced by Nawaz Sharif ─ "the largest system in South Asia". PPP's Naveed Qamar was given the floor next by the NA Speaker to share his remarks. He thanked his party leadership for allowing him to be nominated for the post of PM. "My advice to the prime minister elect would be that the onus is on you. This seat has not been occupied very frequently in recent years and you will make it stronger if you continue to sit on it. Your power flows from this house, and if this house is strong, you will be strong," he said, cautioning Abbasi that this would only be the case "if you pay attention to the members". "The advice you get from technocrats and others will sound very logical, but the advice you get from this house will be that which matters to the people." "You said you have 45 days, but I will nonetheless insist that you have 10 months. How much change can you bring about in this time? You will only progress if you focus on two or three areas and take them forward," he advised. "Prioritising agriculture will make the country stronger," he said. "The country and the country's politics have reached a point where smooth transitions are not visible," he lamented." "We are here to give you all the support you require, as long as you are working in the larger national interest." The AML's Sheikh Rashid, the second runner-up, also congratulated Abbasi on becoming the prime minister-elect "through a democratic process". "However, it would have been great if you had talked about foreign policy in your speech," Rashid remarked. Rashid also expounded on shortcomings in the PML-N's economic policy, including a $5 billion decrease in exports, an "unbelievable" $35bn loan, and unemployment of about 1 million people. As the session started, NA Speaker Ayaz Sadiq had taken an oath from JUI-F lawmaker Usman Badini, who was recently elected from the NA 260 constituency. 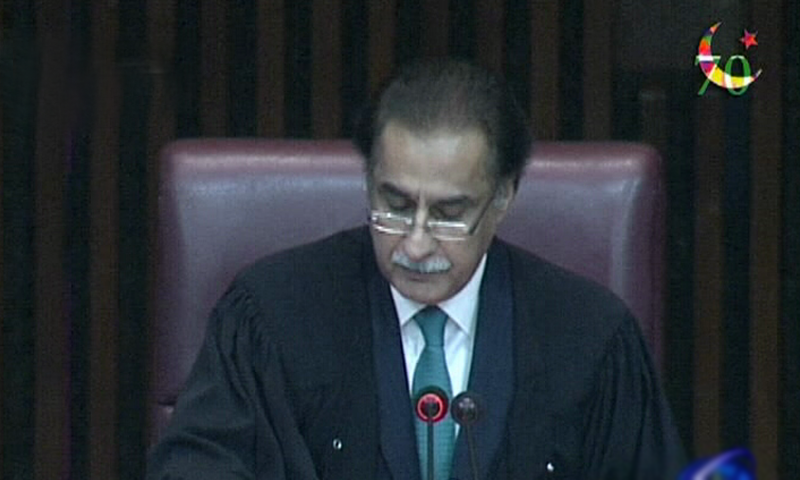 Ayaz Sadiq supervises NA session. The members then prayed for MNA Ejaz Jakhrani's deceased brother, MNA Ghulam Mustufa Shah's deceased mother and those who passed away during recent incidents in Quetta, Parachinar, Ahmedpur East and Lahore. The speaker then read out the house rules, briefing the lawmakers about the process through which the National Assembly will be voting for a new head of government. Sadiq announced that Shahid Khaqan Abbasi, Naveed Qamar, Sheikh Rashid Ahmed and Sahibzada Tariqullah are the four valid candidates competing for the office of the prime minister. PML-N leader Chaudhry Nisar Ali Khan was also in attendance. He briefly became the centre of attention during the voting process as the treasury members were seen conversing with him. Abbasi also met Chaudhry Nisar and both were seen laughing. 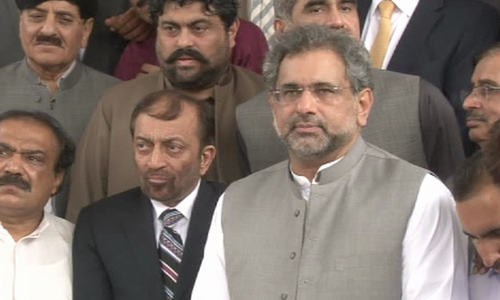 Meanwhile, the lawmakers were also seen taking pictures with PML-N nominee Khaqan Abbasi. The PTI and PML-Q lawmakers voted for Sheikh Rashid, while MQM, PML-N and allies voted for Abbasi. PTI leaders had earlier said that party chief Imran Khan will also attend the NA session, but he failed to show up. The members who wished to vote for Shahid were asked to go to lobby A, while those wanting to vote for Naveed Qamar approached to lobby B. Meanwhile, lawmakers wanting to vote for Sheikh Rashid and Sahibzada Tariq were asked to approach lobbies C and D, respectively. At the end of the polling process, after casting their vote, the PML-N members had returned to the house carrying porters of their ousted leader Nawaz Sharif, prompting repeated warnings from Speaker Ayaz Sadiq and protests from the opposition. 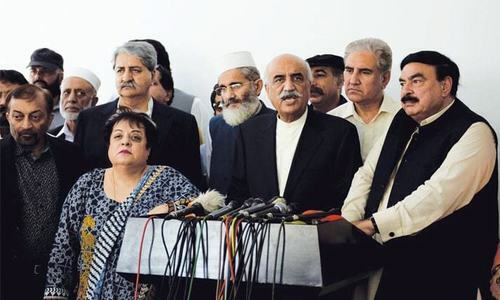 Hours before the NA session, Muttahida Qaumi Movement (MQM) had announced it was withdrawing its candidate Kishwar Zehra in favour of Abbasi, DawnNews reported. MQM leader Dr Farooq Sattar announced the party's decision in a joint press conference following a meeting with PML-N leaders in the federal capital on Tuesday. MQM's Sattar and Karachi Mayor Waseem Akhtar had met with Abbasi, Saad Rafique and Abdul Qadir Baloch. Farooq Sattar talks to media. Talking to the media, Sattar said that despite their differences with the political parties, MQM is trying to maintain a working relationship with them. "We have welcomed the delegation from PML-N and expect them to resolve our grievances," added Sattar. 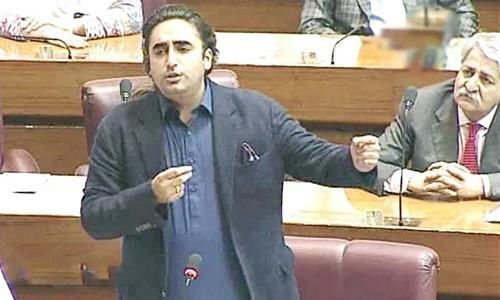 Following a PPP parliamentary meeting, Syed Khursheed Shah had also withdrawn his name in favour of the party's other nominee, Naveed Qamar. Politics haha MQM again on the same track as they did in past. Birds of the same nature. MQM is still alive !! I am not surprised about MQM's decision to support PMLN, and in return they want political and financial favours in Karachi. This is called politics for personal interests rather than standing on principles! When they have absolute majority why running around seeking support from other parties. What are they trying to prove? Now I am not confused between Pakistan and London they are all same by nature. congratulation to MQM and ruling party for choosing a man which has name in L NG scandal.their action will give our country more popularity in foreign media. Because they could not find a more corrupt candidate. Same old dirty politics to safeguard each other. Well done MQM for showing the establishment and the political jokers their worth. mqm in bargain obtained a ministry and instructed to file petition against IK .. which they did. Hahaha and PMLN takes credit of Khi operations?? and then MQM say, we do not get our Karachi share ... we do not get power for Mayor...we do not get this we do not get that... MQM Just fooling Karachiites Like they always did....wake up.... unless you do not stand consistently on Principles , you can not get your rights. wrong decision after voting he shall forget MQM. It is clear that there was a big carrot for MQM in this DEAL. Both MQM and NOON League have lived upto their respective reputations. Nothing reasonable could be expected from MQM. Very predictable. Shame on you MQM! I think PMLN should allow Mr Abbasi to continue as PM until the next elections. Shabaz Sharif would not be able to take over until the end of September. Then he will be PM for only 7-8 months before the next elections. PMLN should reconsider its decision. MQM is pushing their party for total disaster. What PML(N) has done for the people of Karachi that MQM decided to vote for them? Just after July 28 th disqualification of PM by SC, which seemed a major blow to PMLN , just within a week few positive development have occurred like: 1. Nisar didn't part away from PMLN. 2. So called unity among opposition exhibited during the Panama case has been exposed. Each party took its own line of action and couldn't field a single candidate for PM election.3. Not a single PMLN leader parted their ways from the party. That is PMLN is intact. 4. MQM has now supported the candidature of Khakan Abbasi. Initially I was disappointed with MQM's decision but on second thought we need to understand their situatuon. They have no other option. They are being completely ignored by all parties in the opposition. They are being politically victimized in the name of so called across the board operation. Absolutely no one is willing to listen to their genuine grievances. The people of Urban Sindh are being deprived of their due share in the local government with a powerless elected Mayor. Conditionally supporting PML-N was their only option to get some respite to resolve Urban Sindh's and their own issues. PPP is punishing residents of Urban Sindh for voting for MQM. Accept MQM's mandate and let them serve Urban Sindh's residents. MQM never learns from past mistakes, PML N and PPP have both in past have used them for their interest and after that they are ditched. Moreover, these days MQM only negotiate on favors for its leadership, they do not negotiate on addressing grievances of the people who have elected them. MQM will lose support in Karachi if they help corrupts. By choosing Khaqan Abbasi as PM, it looks to me that the country will keep suffering till next election in 2018. Even after the election under the present system, burning issues of General Masses will remain unattended. These politician like to play games and they will keep playing. The looser is the Pakistani Awam. The only solution is Presidential form of government, otherwise Sharifs will keep looting the country's wealth and buying properties in UK and elsewhere. MQM has to overcome the growing impression that it has become a ping pong ball. MQM voters voted for some results and not sacrifices only. In all these years since coming on the big stage what has MQM delivered to the muhajirs in particular & others living in urban Sindh. MQM needs to change its policies or will not have sufficient representation in the next election. Voters are fed up with immature decisions. How could they support PTI or PPP. Both are opposition to it's existence. @Ali , @saqib : MQM was, is and will always be Urban Sindh's first choice. Provided they don't fell victim of divide and rule policies. Lets be fair to MQM they were left with no other choice. I explained it earlier in my comment. this man is still responsible for the compensation of those who lost their loved ones in airblue crash margalla hills. Though there are several other cases against him and Shahbaz sharif. What was the grand idea of disqualifying Nawaz, when rest of the company free to loot, why shouldn't every elected member of be judge under article 62 and 63. Good decision by MQM. They need to get back into the political arena and this is the best opportunity. They will not find a better ally than PMLN. To have a good relation ship with PML (N ) MQM needs to put resign from NA 246 and offer Shahbaz Sharif to contest National assembly election from NA 246 under MQM support for a clear Win. Although Lahore is PML (N ) strong hold but IK can win that seat by having opposition support. If IK win the seat both brothers will be out of GOP. We all know that who will be selected then whats the need for this melodrama? IK failed to show up! Not surprised with MQM's decision. Best wishes. Prime minister elect. He may not be perfect, but he is one hundred times better than Sheikh Rasheed. Goodluck Shahid Khaqaan! Please restore the investors confidence, economy, job creations, political stability and continue the CPEC with full strength! Only way out for our country to become stronger again!! Best of luck to Mr.Shahid ,wish and pray that instead of 45 days ,he completes the remaining tenure of the PML government. The interim prime minister should be given support by the opposition parties to ensure Pakistan's stability, security and economic progress. Political differences aside, the country's strategic goals should remain under focus and pursued without any political confusion. We should all work to strengthen Pakistan no matter what. @Iffi .Absolutely . The biggest mainstream party stalwarts are spoking incendiaries, like a disputed leader in self exile in London. Very unfortunate.
" I am also grateful to the opposition and Imran Khan for remembering us in their daily slandering." I enjoyed this witty remark. I hope that the new PM will continue to take his job more seriously than himself. I am looking forward to more self deprecating humor. Good luck in NAB case! My request to the new Premier is to please direct SNGPL to relay gas pipes of wider specification in Street No. 13 Model Village Chak Shahzad where the gas-consumers are unable to get the normal gas-flow/pressure in their houses as soon as the first rainfall of winter takes place in the month of October or so. This is a very serious issue faced by the community which is not being attended by SNGPL for the last several years. Welcome Abbasi Sahib to take the responsibilities . May god bless the new PM and give him strength to navigate the nation to the righteous and just path. Imran Khan's absence is clearly a signal from him that he disrespects the mandate given to him by the voters. A clear signal that he only wants power and to become prime minister, to satisfy his personal ego and not for the people who voted him in and not for the nation. Let the 2018 elections come and you will see PML-N will sweep even more than before , Imran Khan may now forget KPK also because he did not anything over there. @Hyder Ali, MQM has always supported the ruling party. Soon record of will be made. PML should have fielded Ch. Nisar. Those who are wanted in corruption case be they, Panama of LNG or other corruption case should have been kept away from PM ship. MQM an ideology for the betterment of Pakistan.In urban Sindh no party can replace them.So please whatever your differences please accept them. Congratulations to our new PM Abbasi. People should put their differences aside and support our new PM. Be very careful not to insult Supreme Court and you took the oath to constitution of Pakistan not loyalty to ns. You're are already are on very thin ice. Ddint Ch Nisar say he is going to resign on the day SC announce its decision on the case? And what happened to the scandal against him? The guy failed to run PIA, now running the country! Readers let this PM prove himself. He cannot be that incompetent like his predecessor. His name will be written in the history of Pakistan as PM for few days.